As you are looking at ways to ramp up your math curriculum for the next school year, consider Inside Mathematics. The Noyce Foundation created Inside Mathematics to help educators transform their math practices and to help students better understand the meaning behind the math. The site is rich with videos to show you the strategies in action. This video will give you a brief tour of Inside Mathematics. Worth the 6 minutes to see what it’s all about. The Public Lessons provide videos of teachers in different grade levels (2nd Grade – high school) modeling lessons specific to the Standards of Mathematical Practices. You can also view teachers discussing how setting the proper environment leads to greater collaboration and retention. The Tools for Educators page leads you to Problems of the Month, stocked with lessons that encourage problem solving skills and look at resolutions from different perspectives. They are set up in levels to allow for scaffolding and to provide complexity. Again, there are many videos to assist teachers in visualizing the presentation of material at the different grade levels. Administrators should spend some time with this site too, as it outlines ways to support the classroom teacher, as well as get a better understanding of its tools can assure success for all learners. First, a thank you to the Moreland and Cambrian School Districts and Krause Center for Innovation for including us in this week’s ed tech training program. These districts are fortunate to have teachers who are willing to give up their first week of summer to develop their ed tech knowledge. Their classrooms will definitely be places of higher levels of learning this fall. One tool they will be using is Meograph. This web-based application allows the user to tell a story using maps, time lines, images and voice recording. Even though it appears to be primarily a social study tool, consider its applications in ELA. Students can use Meograph to convey the plot line of a story they read. They could use it to provide evidence of a theme. They could use it to argue the significance of setting to the story line. If you have set up PBL units in your writing class, consider using Meograph to extend a narrative writing assignment or biography. This program provides a fun, creative way to illustrate any writing assignment. Once complete, students can embed their story into their e-portfolio or class webpage. Students can use it for free, but for $20 per year, your class can avoid ads. I’ve used Meograph with our 8th graders, and they do enjoy creating and sharing their stories. Telling stories is a terrific way for students to collaborate, communicate and create! There are numerous ways to tell a story digitally. Slideshows provide an engaging opportunity for students to share what they know. Here are some of our favorite slideshow applications. If you have others you like, please let us know! Nice list of apps and sites that work on all devices! Here's a nice list of apps that work across Android, iOS and the web for BYOT schools, from Jill Thompson at Inside the classroom, outside the box. I've been waiting for someone to create a high quality list like this - great stuff! Please also look at our Android 5 great search tools post, as well, for more options to find great apps on Android (a couple of which also search for iOS apps, too!). 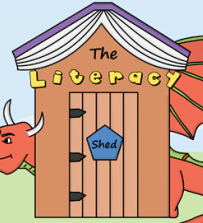 While researching tools that promote digital storytelling, I came across The Literacy Shed. It is a collection of visual resources that teachers can use as a stand-alone lesson, be the basis of a literacy unit, or enhance a unit already in use. The creators of The Literacy Shed has categorized the clips and images in thematic “sheds”. They share details of each, with a little historic background, places the clip in context, and then offer numerous lesson suggestions. This is the link to The Great Animations Shed, which includes a clip from the movie, The Rocketeer. After a brief set-up of the clip, the author offers 6 writing ideas, including writing a newspaper article, a letter, a narrative from a specific perspective, or create a back story. The options can be adapted to different grade levels and learning styles. Teachers can expand this lesson by having students research World War II, flying machines, or other related topics and share what they learn. Finding non-fiction resources would be a great way to enhance the lesson as well. Consider using the clips for flipped learning lessons. Here's a great list by David Andrade from Tech & Learning - mostly about Chromebook and Chrome, with some Android spice thrown in. Lots of great details here. Accurate info and well worth the time to dig in! Don't forget our review of Chromebooks in the 7th Grade Classroom. Here's a Google Group called Google Chromebook Schools - I just asked for membership, but it looks like there are a significant number of posts. There are MANY more resources available at Chromebook Classroom. Thanks to of Chromebook Classroom for pulling together this fabulous collection of tools, techniques and tips for Chromebook uses in education! Great stuff...take a look! Here's an interesting article about issues and opportunities managing tablet apps - both iOS and Android. I was fortunate to be one of the people interviewed for this article. I hope you enjoy reading it! Eight unique sites for summer; read if you want a different list! Happy Summer! Trying hard not to fall into the 'here are 100 websites for summer' lists that are sometimes seen, we instead provide a short list of some fun, useful (and in some cases, offbeat) websites. PBS Kids - Many fun games to play and shows to watch. Also check PBS Kids Mobile Apps (including some Android!). For teachers, PBS Learning Media website has, I believe, just gone through a redesign, and it's cool. Gobs of training videos and other good PD for teachers, many other resources like lesson plans based upon Common Core and other standards. "Customize" it for your region/state when you get on. From the We Are Teachers blog: 10 things every teacher should try this summer (NOT tech, NOT classroom related!!!). Must read! An extremely good Pinterest summer fun list, by Hope Benson. For boys ... exploding things, mud and other fun, dirty summer stuff to do, from the Reading Confetti blog. A unique photo scavenger hunt from The Chaos and the Clutter blog (I love that name btw). And now, for something COMPLETELY different (hopefully the above were, as well). This was written by Maynard Webb, a well-known Silicon Valley Executive, about teaching kids to dream big. Take 5 minutes to read it; you won't regret it. That's it - 8 links to go explore. Now, go out and do something! Cheers!!! For teachers, summer allows time to reflect on what went well during the school year, and where change can take place. With the need to redefine units to reflect CCSS and 21st Century skills, you may be looking for some new resources. Those listed below are not only great classroom tools, but are fun places to visit this summer! Bookmark this infographic and refer to it often! Math - 6 (not 60!) most popular posts- videos, lesson plans & more! Here's a compilation of some popular math posts done in the last couple months. We hope it helps you when you're in thoughtful, more relaxed planning mode this summer. Enjoy! If you have a favorite we missed, let us know! National Library of Virtual Manipulatives This free site supports K-12 math students - tons of online exercises in Number and Operations, Geometry, Measurement & more! Each major concept is organized by grade (K-2, 3-5, 6-8, 8-12); once you click the appropriate tile, a long list of applicable practice items from which to choose will be listed. This is a MUST see! NSDL - Phenomenal site. Another must see! Plan on spending some quality time at the National Science Digital Library. The site has a stunning array of easy to find resources and online tools that are directly linked to CC Math standards. Interactivate - Common Core aligned lessons plus. Interactivate (part of Shodor.org) includes activities (online practice) and lessons (a series of well-defined and understandable chunks that do seem to be a complete lesson). SEDL - CCSS Math Videos for Better Understanding: The SEDL site is an amazing resource for teacher education. They now have a detailed set of videos describing key standards of the CCSS in math (ELA coming soon), by grade level and free to view. Video purpose: clarify the meaning of the standard, not how to teach it. LearnZillion - Common Core Aligned Lesson Plans Plus LearnZillion has a growing compilation of Common Core aligned lesson plans and other resources. It appears they start in earnest at 3rd grade and up. LearnZillion about 2000 lessons, with more coming, supporting both ELA and Math. Numberphile - Engaging Math Videos Numberphile is a collection of videos dedicated to math, numbers and other related areas. Teachers can use these to brush up on topics or post as a “flipped” learning opportunity. There are explanations of laws, theorems, and such. "Real world" math is also included. Educators who want to inject ed tech tools into their curriculum to truly augment student learning need to ponder SAMR. For instance, the "Substitution" level is using Google Docs as a word processor to replace paper and pencil - that is the "Substitution" level. No doubt a good start, but, uh, insufficient in the grand scheme of things. You can probably get the sense that moving 'up' this chain is a good thing for students. Watch the short video to learn more! If you're still curious (hint: you should be! ), page through Dr. Puentedura's preso, which provides context and some good examples in different subject areas. It'll take a minute to load up in your browser. As we wind up the school year, it's a good time to evaluate what you're trying to accomplish with your 'program' in general, where tech can and should fit, and also to try to work your way 'up' the SAMR model. Or, at least plan, and then DO, this evaluation during the calm(?) summer months. For some additional resources, go to this page on the Technology & Learning website. There is a wealth of information beyond SAMR that's worth spending some time exploring as well. If you're already on summer break, congratulations on a job well done, and if you are still wrapping up the year: hang in there, the finish line is in sight! Cheers to all!! !